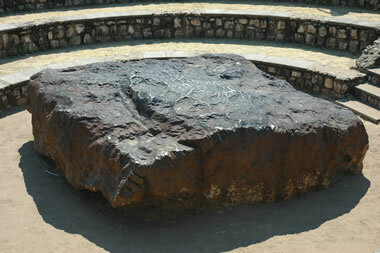 Hoba Meteorite - world's largest: Photograph of the Hoba Meteorite taken by Giraud Patrick on August 13, 2006. Hoba weighs about 66 tons and is nine feet long by nine feet wide by three feet thick. Image used under a GNU Free Documentation license. In 1920, a farmer was plowing a field near Grootfontein, Namibia when his plow suddenly screeched to a halt. Curious about what he had run into, he dug in the soil to find a large piece of metal. The large metal mass quickly attracted the attention of scientists and others, who identified it as a meteorite and removed the soil around it. Although excavated, the meteorite has not been moved from its location of discovery because of its great weight. However, many pieces have been removed for scientific study and through vandalism. The farmer had discovered a 66-ton iron meteorite - the largest single meteorite ever found and the largest piece of iron ever found near Earth's surface. It is tabular in shape and about nine feet long, nine feet wide and about three feet thick. It was given the name "Hoba" because it was discovered on a farm named "Hoba West." Hoba is thought to have fallen to Earth about 80,000 years ago. It is composed of about 84% iron, 16% nickel, and trace amounts of cobalt and other metals. An abundance of iron oxides in the soil around the meteorite suggests that it was much larger than 66 tons when it landed and has suffered significant losses from oxidation. It is surprising that this meteorite is not surrounded by a crater. Objects of this size should punch through the atmosphere at a very high rate of speed and hit Earth with enough force to blast a significant crater. No crater is present around the site of the meteorite. This suggests that it fell to earth at a lower rate of speed than expected. Some scientists believe that the flat shape of the object may be responsible for its low velocity at impact.